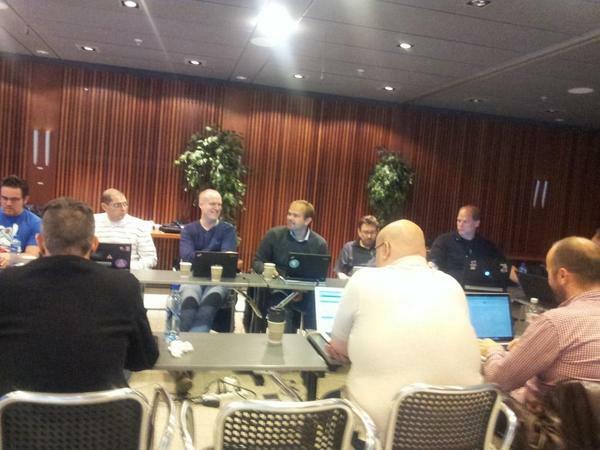 The last VDD was held in Oslo, in the offices of VG.no and Schibsted at Akersgata. After that we went to aDevOps meetup and finished the evening going for some food and drinks. You can see the notes as they were taking throughout the day on the VDD14Q3 page. Next meeting, VDD14Q4 is scheduled for the week of November 20. This wil happen together with VUG9 in Barcelona, Spain following the Velocity Conference on November 17-19. Backend connection request timeouts. You can read the background of the discussion in the list. Decision: Close more intelligently - ditch rest of list whenever we get a new connection. A fullpackage of backend connection handling to be discussed as well. Stale-While-Revalidate in Varnish. Background is also available on the list. Saint Mode in Varnish 4.0. Background available here. Decision: Add the hash key to the busyobj, so that Saint Mode can be implemented on a VMOD. Decision: Agree on a common package name for DEB and RPM distributions. Add the PKG_CONFIG_PATH patch to the documentation. Decision2: Certain VMODs will be pulled into Varnish Cache. For now we start with vmod-cookie after teaching it about Set-Cookie hearders. Decision2: PRIV_REQ memory storage is needed for vmod-cookieand need to be implemented in Varnish. PHK will do it unless other do it before him. 4.0.2 RC RSN. Lasse Karstensen, Varnish Release Manager, is in charge of this. See the merging page for details. Still the same we had last meeting. Surrogate Control. Sections 2.2 and 2.3 of the Edge Architecture Specification. Decision: We'll do this, and make it a configurable in 4.0.x/4.1. Default on in (future) 5.0. If surrogate-control is there, prefer that instead of cache-control. Standarization of Surrogate-Control Header and Targetting in builtin.vcl (what we called default.vcl in Varnish 3.0 and older). Besides working through these points, we did a Mini Bug Wash as well as discussed PCRE limitations, Phantom 503s, Header Token editing and other subjects upon which a decision was not made.